Yufu Shohaku is a second-generation bamboo artist from Beppu, the son of Yufu Chikuryu. His father apprenticed to Sato Chikuyusai, who was the teacher of bamboo master Shono Shounsai. Shohaku began making bamboo baskets in elementary school and achieved mastery by middle school. With his father, he created many styles of flower baskets that made Beppu famous. Today he is known for traditional Beppu rough-plaited baskets that blend plant roots and bamboo chunks. 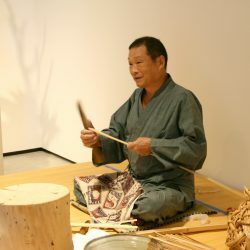 An independent artist, he is the leader of his local bamboo art professional association and the recipient of numerous prizes, include the Beppu Mayor’s Special Recognition Award and Chairman’s Prize at the Beppu Traditional Craft Arts Exhibition. His work is in the collection of the Beppu City Traditional Bamboo Museum.